Many travellers to southern Italy use Naples as a base to visit the archaeological sites of Pompeii and Herculaneum. These two Roman cities were buried in ash during the eruption of Mount Vesuvius in 79 AC, and are considered among the most important archaeological sites in the world. Both were preserved in a state of “suspended animation”, as the cities were suddenly frozen in time by the catastrophic eruption rather than being gradually abandoned over the centures or transformed by subsequent conquests. Pompeii was completely buried in just 12 hours, and houses, temples, baths, brothels, restaurants, and citizens were preserved under the ashes until being unearthed in 1748. Pompeii is a much larger site than Herculaneum and more striking, while Herculaneum is better preserved as it was covered in a layer of protective mud and volcanic ash, sealing the remains completely and preserving even materials like wood. 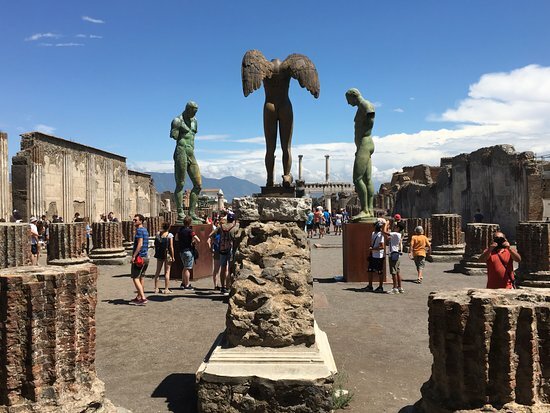 Combining a stop at the top of Mount Vesuvius with a visit to Pompeii or Herculaneum is a great idea. Discover this significant sites with us!!! !